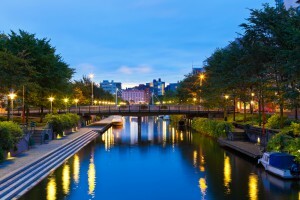 Water scarcity and water quality are important issues in urban areas across Europe and beyond. New technology or management approaches to tackle these issues are needed. Those approaches are more likely to turn into real innovations that are actually implemented and taken up by the market if there is evidence of their benefits or added value in economic, environmental and societal terms. Therefore, a method to prove the value of new solutions is needed too. DESSIN demonstrates and promotes innovative solutions for water scarcity and water quality / the implementation of the Water Framework directive (WFD) and shows the value of those solutions for the water sector and society by also demonstrating a methodology for the valuation of ecosystem services (ESS) as catalyser for innovation. By this twofold approach, DESSIN will be able to demonstrate how innovative solutions in the water cycle can increase the value of the services provided by freshwater ecosystems, enabling a more informed selection of the most promising solutions in regards to their impact on the water body and their economic implications. Scientists, public and private water management organisations and end-users, technology providers (SMEs), supporting RTD experts and relevant public authorities within DESSIN will test, validate and demonstrate innovative solutions at five demo sites across Europe with special focus on urban areas. The solutions include technological, monitoring, modeling and management approaches for a more resource-efficient and competitive water sector in Europe, such as decentralized water treatment units, real time control of large scale systems, sewer mining and storage of freshwater in aquifers, among others. The demo sites Emscher (Germany) and Hoffselva (Norway) contribute to ecosystem services related to water quality/Water Framework Directive and the demo sites Westland (Netherlands), Athens (Greece) and Llobregat (Spain) to water scarcity.